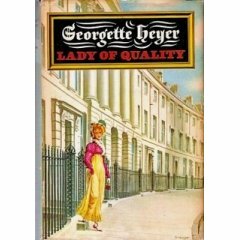 I finished Georgette Heyer’s novel Lady of Quality last night, and it was such a pleasurable read! I don’t feel like doing a proper review, still suffering as I am from insomnia and general all-around crankiness, but I do want to say that I’ll have to find myself some more Georgette Heyer books because this was just so much fun. It was a quiet book, about a 29-year-old woman named Annis living in Bath in the regency period, so, say, around 1810-1820 or so. She has recently left the home of her brother and his wife and family and has set up on her own, a mildly scandalous move for a woman people are beginning to call a spinster but who is still quite young. She is smart and beautiful with wit and a satirical sense of humor; she has received several offers of marriage, but none from any man who really impressed her. Into her life come Lucilla and Ninian, two young people in their late teens; Lucilla has run away from home to avoid parental pressure to marry Ninian, and Ninian accompanies her to keep her safe. Chance brings Lucilla to Annis’s house, and the rest of the novel is about what to do with the girl, who decides she will not return home and who comes to love Bath and the pleasures it offers. She also brings her uncle on the scene, the rakish and rude but still mysteriously charming Oliver Carleton. Annis has never met a man quite like him before. One of the interesting things about the book is the way Annis seems like an early example of the “excellent woman” phenomenon of which Barbara Pym wrote so well. Everyone wants to turn Annis into an “excellent woman,” one of those unmarried women who spend their lives taking care of others. They believe she should have stayed at home with her brother, enjoying his “protection” and helping to take care of his children. An independent woman who lives for herself is almost too much for people of the time to comprehend. Living on her own and according to her own wishes is acceptable only because Annis has some money and has the stubbornness and high spirits to insist upon it; otherwise, she would surely find herself drawn into other people’s lives and into their houses, away from her own. But she works very hard to keep her independence and to ward off the prying, meddling people who want to take up her time and attention. In contrast to Annis is Miss Farlow, a single woman, considerably older than Annis and without any means to support herself — she’s an example of the Miss Bates type (from Emma), a genteel woman without much money who depends on the kindness of others to get by. Annis has kindly agreed to hire her as a companion, which earns Miss Farlow’s great gratitude, but unfortunately she repays her with irritating, never-ending chatter (also like Miss Bates) and vindictive jealousy when Lucilla appears on the scene. Miss Farlow is a figure of fun, but she also shows an alternative fate for women — without her money and without her beauty, Annis could easily be another Miss Farlow, alone and penniless. Ooo, this book does sound right up my alley as well. Heyer is an author whose name I’ve seen bandied about a lot but was never quite sure what kind of books she wrote. I love Georgette Heyer! My school library was stocked with them and I’ve read them all many times over since my teens. I really recommend ‘Venetia’ – it’s my favourite. I’m glad you enjoyed ‘Lady of Quality’. I’ve never heard of Georgette Heyer, but now her name is going on my list of authors to try! This sounds like a fun story. There’s something sort of Austen-esque about the characters. I guess everyone had their niche in society at that time (and you probably didn’t dare try to be anything different). From what I’ve read Heyer was pretty scrupulous about getting her historical facts correct. I actually already have lined up a book called Cotillion (again from Sourcebooks–I wasn’t going to…but it sounded too tempting), which sounds much lighter than the Heyer book I just read. I’ve never read any Heyer books, but when I worked in a lending library they were very popular. Perhaps I should read one. I’ve just finished An Infamous Army by Heyer and can’t wait to read another of her books. What I’d really like to read is one of her mystery books too. Good luck mooching — I have tried to find her books there with no luck. Imani — oh, do check her out! I’d love to hear what you think! Thanks for the recommendation Becky! Sarah — she’s a pleasure, particularly if you like that time period, which I know you do! Danielle — good to know she does her research thoroughly. Lady of Quality struck me as quite accurate, based on what I know, at least. The book you read does sound quite a bit heavier than mine was. Eva — definitely it was! BooksPlease — interesting to know how popular she is. Before blogs I hadn’t heard of her, but I can understand why she’s so popular now that I’ve read her. Sassymonkey — she is really prolific, isn’t she? I have no idea how many books she’s written, but from the little I’ve looked around, I’ve noticed quite a few. Iliana — she wrote mystery books? Cool! I was lucky to get this novel on Book Mooch, but now I see there aren’t many left. Too bad. I am in pretty much the same situation as Danielle. I just read An Infamous Army, and I am about to read Cotillion! I can see myself having to glom this author soon! Cotillion is one of my favorite Heyers! I love Georgette Heyer too! One of my favourites is The Grand Sophy. But I seem to remember that Bath Tangle and Faro’s Daughter were also fab. Oh they’re all good, it doesn’t matter which you pick. Well, I’ll make sure to keep an eye out for Cotillion, then! And litlove — I’m happy all her books are good; there’s so much good reading ahead! Look on ebay. Always some lovely Heyer books on there. I love them all!